Inventory We are a resale marketplace, not a box office or venue. Ticket prices may exceed face value. This site is not owned by MGM Grand Garden Arena . MGM Grand Garden Arena is located in the MGM Grand in Paradise, Nevada, USA, and is patterned after New York's Madison Square Garden. The arena has a seating capacity of 16,800 people and is located at 3799 Las Vegas Boulevard South. The MGM Grand Garden Arena has held events such as the Billboard Music Awards, the Andre Agassi Grand Slam for Children Benefit, the VH1 Divas Las Vegas shows, and other sporting and special events such boxing and Ultimate Fighting Championship (UFC) PPV events. From 1996-2000, it hosted wrestling's WCW Halloween Havoc PPV event. The UWF television event Backjack Brawl was held at the venue in 1994. For the last three years it has held the Academy of Country Music Awards (ACMA) in May. On December 6 2010 it hosted the first ever American Country Awards. MGM Grand is most known for some of the best boxing events year after and this year should be no different. Because of the diversity of the events held, the facility has earned an enormous fan base. Many locals have found themselves returning to the venue year after year to see their favorite acts. The arena has not undergone any major renovations but is continuously being maintained. 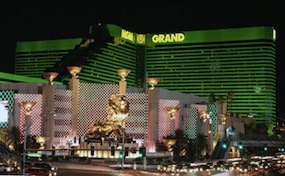 MGMGrandGarden.Arena-LasVegas.com is not affiliated with any primary box office or supplier. We are a privately owned and operated business specializing in sales in the secondary market. Prices on our websites tend to be above face value but will change quickly with demand. To buy tickets for any MGM Grand Garden Arena in Las Vegas simply click on the event of interest or call our operators at anytime.